TPO roofing is one of the many terms you may hear when discussing roofing, but what is it? TPO is among the most common types of roofing found on large commercial buildings. In the case of roofing, TPO stands for Thermoplastic Polyolefin. This is a single-ply roofing membrane. A TPO roofing system includes one layer of synthetics along with reinforcing scrim that helps cover flat roofs. TPO membranes are made in sheets that measure 20, 12, or 10 feet wide and brought to the site in rolls. Since TPO roofing is a single-ply roofing membrane, it does not include insulation, which some other roof types do. This means that you can choose whichever type of insulation makes the most sense for your commercial facility and your budget. Some of the most common insulation types include Polyisocyanurate (Polyiso), Expanded Polystyrene (EPS), and Extruded Polystyrene (XPS). Polyiso is the most common for roofing. While it has a higher R-value rating, it is also more expensive. EPS delivers the best R-value per dollar and it is used for roofing as well as walls and floors. XPS is semipermeable and is priced and performs between the other two options. Another strong advantage of TPO is that it is Class A fire rated. This is done by adding fire retardant chemicals during manufacturing. Since TPO is highly fire-resistant, this is good news for businesses who want to reduce their risk, both to customers and to the company itself. In the long term, TPO roofing tends to save a reasonable amount of money. This is because most TPO materials are bright white and highly reflective. This material makeup means that UV rays as well as heat reflect off of the building. That results in lower electricity bills during the summer as there is less electricity needed to keep the building nice and cool. 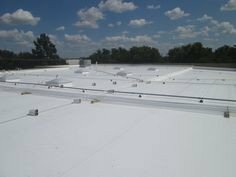 In addition to all of the above advantages of TPO roofing, it is possible to install it with your choice of methods, including plate bonding, ballasting, adhering, or mechanically attaching it. Some manufacturers even have membranes that can be adhered with low-rise urethane foam. Many building owners also appreciate the fact that while white is the most popular color for TPO, it is available in a wide range of colors some common ones include tan and gray. The TPO membranes are also highly rated for wind and are grease resistant. The first step to installing TPO is always to prepare the existing substrate. Your roofer may do this by removing the current roof or by cleaning it. Then, the installation that you have selected gets installed. From there, your contractor can attach the TPO membrane to the cover board using either mechanical fasteners or a bonding adhesive. The contractor will roll out the membrane and then weld the seams together using a hot-air gun. For all of your TPO roofing needs, contact Transcendent Roofing.